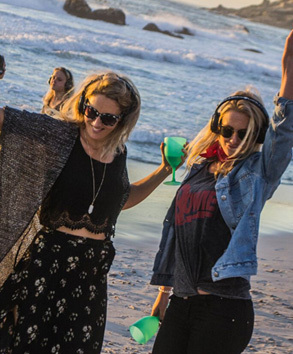 Party all night with a Silent Disco…where everyone can be happy with the music choice… even the neighbours! Whether as the main attraction or a late-night add-on after the sound curfew…we are just the thing to make your party special. Make the most of your wedding party and have a truly memorable Silent Disco that keeps the mirror Ball spinning into the small hours for all your friends & family, whatever their music tastes. 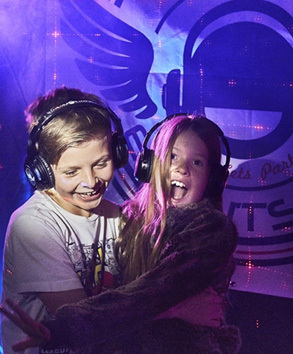 From 5 year olds to 80 year olds we’ve got music to keep kids of all ages rocking & raving at whatever venue you can imagine. Why not try something a little different and get 3 generations on the dance floor at the same time all listening to music they love. Gala dinners, year end functions. 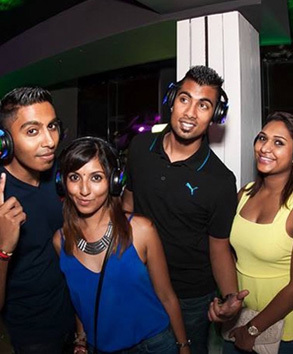 Cater for every taste on one dance floor with our multi-channel headphones. And don’t forget we can also supply Sound Systems, Lights , Staging and everything else that you might need for a “loud “ party too. 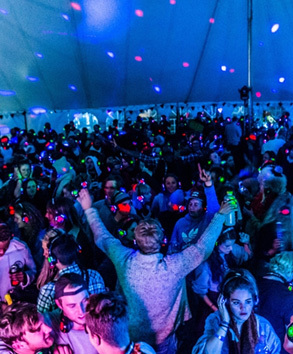 Whether to take your event later than the sound restrictions would usually allow or simply to offer party goers the hilarious experience of Silent Disco, we’re the tent that’s always full of happy people. 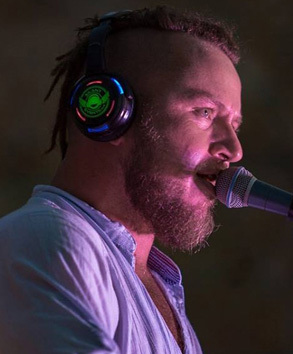 Mic up a band, orchestra or choir and have them immerse you in the experience of a silent concert. Now there is no limitations to where you can have a concert. Silent Events offered a great solution to an unexpected “noise curfew” at a company conference Gala function. 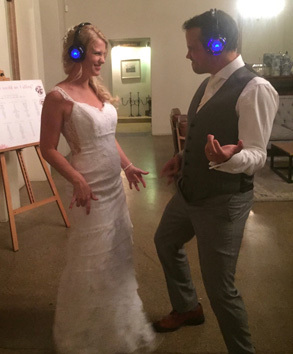 The guests were initially sceptical about the headphones, but once they realised they could choose between no less than 3 DJ’s playing different genres of music at any given time, there was no stopping them having endless fun on the dance floor whilst entertaining those who opted to observe from the side. It was truly a unique experience I can recommend if you want to add a different “spin” on any corporate event. Silent events have made the pop-up movie scene a whole lot more fantastic. Silent Cinema is one of our most exclusive offerings made possible by the silent event team – We work together across the country. Love the team. Love the magic! Matt, Cameron, Vicky thank you for all your support over the years and for making things run smoothly every time. The friendly competence of the Silent Events crew always make them such a pleasure to work with. Their expertise with this innovative equipment is second to none and every gig is both well received and fondly remembered. These guys just keep getting it right. Thank you so so so much for such an incredible night. We had 40 children utterly obsessed with the music and the lights. Miguel was fabulous….arrived on time (which in itself is amazing!) And was happy and accommodating….I was running around like a headless chicken and he kept everything cool, calm and collected. The kids loved him and he kept them jamming all night. If I play my cards right I will have him back for a childless disco next year for my birthday. Matt and Lisa….thanks so much for such a professional set up you have. It was flawless.